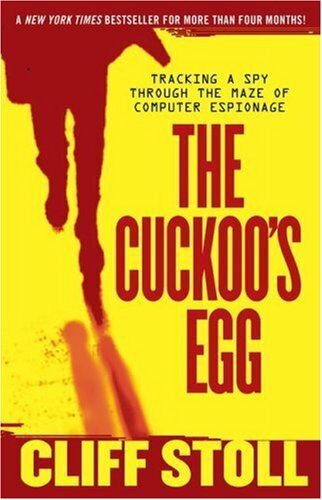 The Cuckoo’s Egg by Clifford Stoll is an entertaining account of a true life experience that made the author an American hero. The story is about Stoll, an astronomer turned programmer who tracks down a hacker through the labs of Lawrence, Berkeley (where he is stationed) all across the USA and then across the Atlantic into Germany where he finds his hacker nemesis. The origin of all this is an accidental spotting of a system accounting error of a mere 75 cents on the server that Stoll is assigned to maintain. Determined not to let the matter go, he snoops around and locates a user named ‘hunter’ and then starts tracking his every move by simply printing his keystrokes. He watches the hacker enter from Tymnet, copy a Trojan horse program (ie the Cuckoo’s Egg) onto the computer through a gaping hole in the Berkeley Unix system, waits for the system to run the Trojan horse and gain super-user privileges. And through the Berkeley System he goes on to hack into systems like Milnet that contain crucial information about the US military and Navy. This book is a landmark in itself since it prompted the US government to start taking the matter of Computer security seriously as the hacker turns out to be an agent working for the KGB. This is apparent from the fact that even though organisations like the NSA and CIA seem interested they claim its not under their bailiwick to start an investigation. The FBI don’t seem interested since the case doesn’t involve a ‘half a million dollar’ loss. The story is well woven with Stoll’s description of his everyday life, the fact that he bakes chocolate chip cookies and that he is a ‘master sulker’. A must read for anyone who loves networking or cares for computer security.